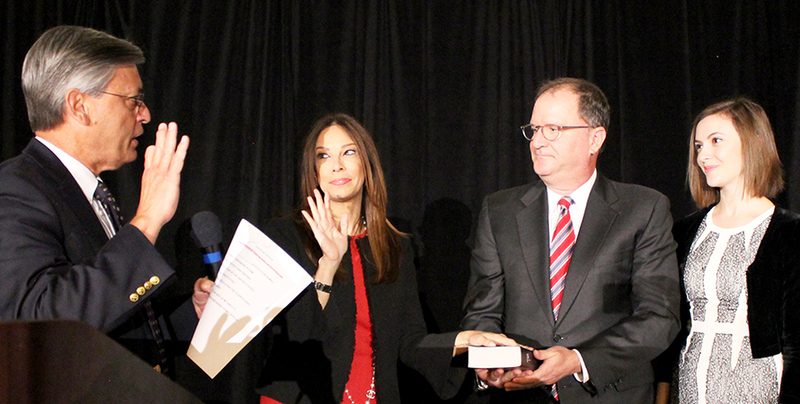 MICHELLE SUSKAUER is sworn in as president-elect of The Florida Bar by Chief Justice Jorge Labarga in Boca Raton, as her husband, 15th Circuit Judge Scott Suskauer, and daughter, Becca, look on. Newly sworn-in Bar President Michael Higer looked over at Michelle Suskauer on the dais at the General Assembly and described her as a passionate Bar leader who will make a passionate president. “But today, and only today, she is speechless, so I’ll leave it at that,” Higer said with a grin. As is the custom, the Bar’s president-elect does not give a speech, but Suskauer was sworn in by Chief Justice Jorge Labarga and introduced by her close friend, 15th Circuit Judge Lisa Small, who serves on the bench with Michelle’s husband, 15th Circuit Judge Scott Suskauer. “Most definitely, Michelle would attribute these qualities to the strong example set by her parents. She deeply cares about the future of our profession, and she will do the best she can for all members of the Bar and the judiciary,” Small said. “She is a lawyer’s lawyer, a tireless advocate for our profession who can relate to all members of the Bar, irrespective of what area you practice or what form of practice, whether it is solo, small, big firm, government practice, in-house counsel. Michelle understands the daily demands and pressures of being an attorney, while being able to balance family and participate in the legal community,” Small said. Suskauer is also a “nationally recognized TV legal analyst, and a seven-year member of The Florida Bar Board of Governors, having chaired some of the most important and key committees,” Small said. She’s served as president of the Palm Beach County Bar, president of the Florida Association for Women Lawyers, Palm Beach County chapter, and is the current president of the Legal Aid Society of Palm Beach County. “Now, I’m not going to name all of the awards that Michelle has received over the years, but I am going to name two that are very important to her: She’s a recipient of the Justice Barbara Pariente Leadership Award from FAWL and is also a recipient of the Serving Justice Award from the Legal Aid Society of Palm Beach County,” Small said.